Popularly known as the Punakha Dzong, Punthang Dechen Phodrang (The Palace of Great Bliss) was built in 1637 by the Zhabdrung. The gigantic Dzong was damaged 6 times by fire, once by flood and once by an earthquake. On 17 December, 1907, the first king of Bhutan, Ugyen Wangchuck, was crowned here. The Machen Lhakhang, a temple inside the Dzong enshrines the mummified body of the Zhabdrung who passed away in retreat here in 1651. Dzongchung (or the little Dzong), built in 1328 by saint Ngagi Rinchen can still be seen opposite the main Dzong. 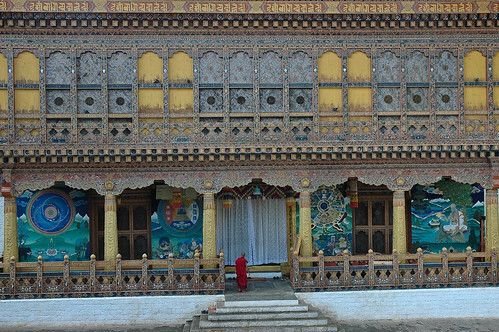 The spectacular Kuenrey (assembly hall) in Punakha Dzong is open to the tourists. The spectacular Punakha Dzong is one of the most beautiful Dzongs in Bhutan. 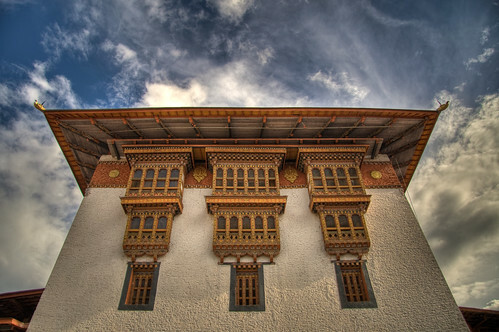 The central tower (Utse) of the Punakha Dzong. 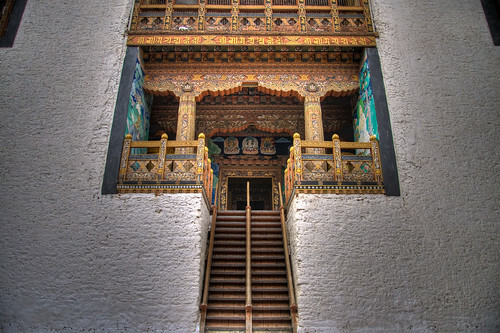 Traditional wooden staircase to the temples inside the central tower of the Punakha Dzong. The Kuenrey, at the far end of the Dzong is a must-see. As soon as you enter this temple, you will be awed by the giant statues of the Buddha, flanked by the Guru and the Zhabdrung. Dont forget to look up at the ceiling. Hundreds of beautifully painted dragons adorn the high ceiling. Be sure to ask your guide about the paintings on the walls. The Kuenrey of the Punakha Dzong has the most beautiful painting of the 12 episodes of the life of the Buddha (Zedpa Chuni). This series of 12 paintings can tell you a lot about Buddhism. The Kuenrey of the Punakha Dzong. After you climb the steep staircase, and just after you step in through the huge door, you will find the painting of Buddhist astrology on the wall on your right. 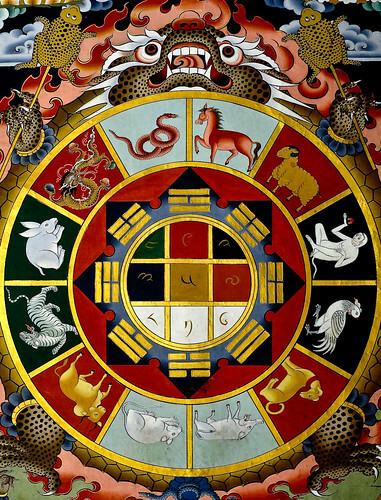 Buddhist artrology is a mix of Indian and Chinese indigenous systems. 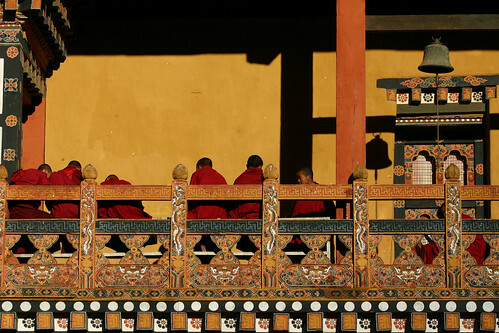 In Bhutan, artrology plays a significant part in the everyday lives of the people. Astrology is consulted right from birth to death, and for all the major highlights in a man’s life. With the help of the painting, try to find out what animal sign you are. There is something about visiting the Punakha Dzong in the afternoon. The afternoon sun brings out the richness of the paintings. The rays slant just enough to hit the organically painted and carved wooden railings. Monks seem more relaxed in the afternoon, and if you are a photographer, you wont get enough of the red of the beetle nut glistening from the mouths of our maroon robed monks. Monks enjoying the afternoon sun. Punakha Tshechu is the special religious and historical festival of Punakha held on auspicious days once a year. The festival usually happens in the spring. There is nothing like it if you can time your visit with this colourful festival. 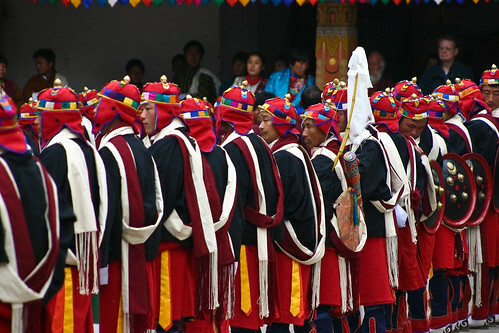 Traditional Bhutanese warriors at the Punakha Tshechu. You will not be allowed to enter the Dzong without proper permits. Make sure your guide has the permit ready with him. You will not be allowed into the Dzong without a licensed tour guide. You will not be allowed to enter the Dzong if you are wearing: caps, hats, shorts, vests or umbrellas. You may take pictures in the Dzong. But once inside a temple in the Dzong, photography is prohibited. When visiting the Kuenrey, you must take off your shoes. The Dzong does not have restrooms appropriate for westerners. You are advised to be prepared accordingly. 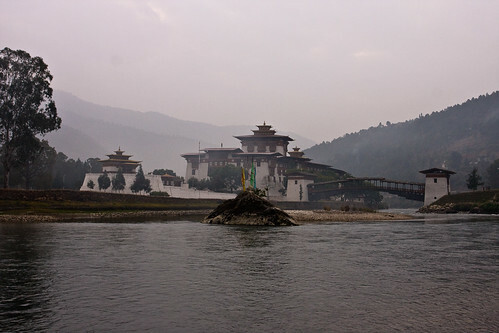 Punakha Dzong is an important Dzong, frequently visited by His Majesty, His Holiness, and other members of the Royal Family. During your visit, if you should come across them, proper respect must be displayed. i need photo of samdrup Jongkhar Dzong , i search many time in google but i didn’t get the photo of s/jongkhar monastery Dzong. PERFECT PLACE , I WISH ONE DAY I WOULD VISIT YOUR HEAVEAN TAMPLE.. It was my pleasure to visit Punakha Dzong in December 2010 and got an opportunity to meet His Emninece Lam Dorji Rinchen, who is also Principal of Dechen Phodrang Monastic School in Thimphu. Visiting Bhutan was really wonderful experience and meet several people and great monks.